When space is limited and demand for access to quality medical care is high, typical telemedicine solutions may not always be appropriate. 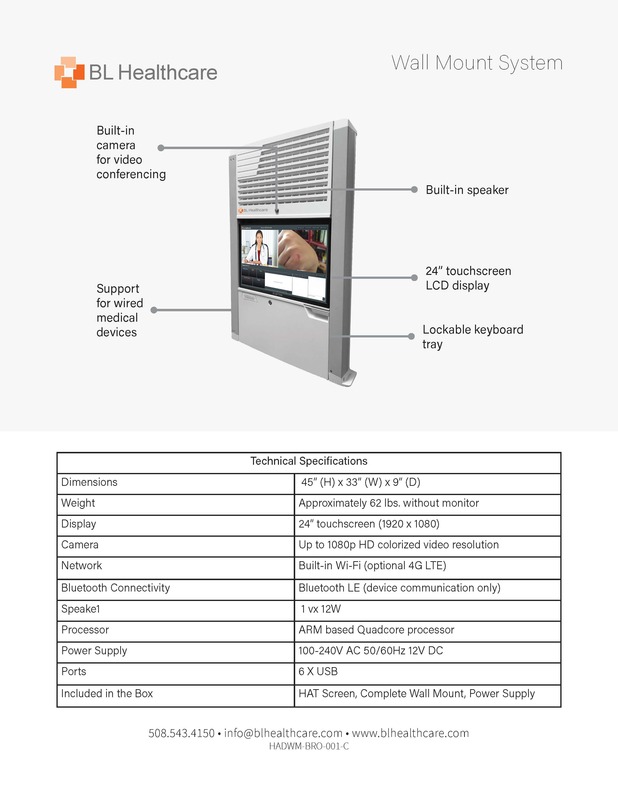 Our wall-mounted Healthcare Access Tablet is an affordable, space-saving telehealth solution providing virtual healthcare delivery services in remote areas and connecting patients with providers from virtually anywhere in the world! The all-inclusive, wall-mounted device is the perfect telehealth solution for institutions where real estate can sometimes be limited. Satisfy both your team and your health plan by internalizing your healthcare services. Improve and maintain workplace productivity by bringing the doctor directly to the office. Safe, secure, and easy to manage, this device is the perfect telehealth solution for corporate offices, warehouses, schools, pharmacies, and so much more!